Konalupaka Jain temple houses the idol of Lord Rishabha who is considered to be the first of the Jain Tirthankaras. The temple also displays idols of the other Tirthankaras on either side. The most fascinating vista is that of the 51 inches tall statue of Mahaveer. – The huge statue of Mahaveera which is made of a single piece of Jade stone is a major attraction for tourists. – Kolanupaka is a religious site which has strong historical significance. The Jain temple is one of the most popular places of visit. However, the place is also frequented by tourists in order to savor the feeling of being part of history. At a distance of 83 km from Warangal and 81 km from Hyderabad, the 2000 years old Jain Temple of Mahavira is located in Kolanupaka village (also called as Kulpak) in Nalgonda district. The temple is decorated with beautiful images of Tirthankaras and it’s one of the important Jain pilgrimage sites in the country. 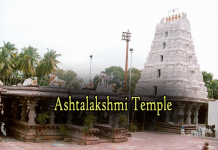 It is also a popular place to visit around Warangal & Hyderabad. Kulpakji is an important pilgrimage center for Swetambara Jains of South India. This is one of the popular one day trip near Hyderabad. Jainism found its way into the Telangana region in the 4th century AD. The Jaina movement started from the days of the Satavahanas and picked up speed under the rule of the Rashtrakutas. Several Jain coins have been unearthed in various locations indicating the existence of a relationship between Jain monks and Telugu rulers. 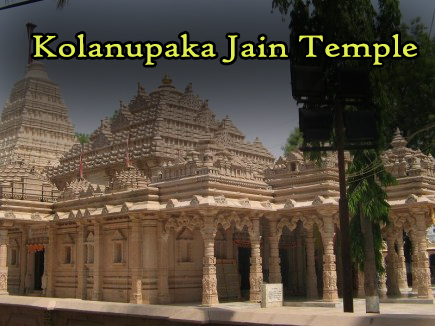 It was during this time that Kolanupaka emerged as one of the prominent centres of Jainism. In its present form it is an important pilgrimage site of the Svetambara Jains. The temple uses red sand stone and white marble aesthetically to enhance the stylistic aspects of its interiors. The entrance gateway of the temple is flanked by Lord Simandar Swami and Mata Padmavati. The most beautiful piece of art within the temple premise is probably the huge stained glass window depicting the Jain guru Parshvanath. The Kolanupaka Jain temple is an architectural marvel. There is beauty engraved in each pillar, wall as well as the Tirthankara idols which surround its premises. Even the temple roof is replete with carvings or stained glass paintings like the one of Jina Parsvanatha mentioned in the preceding section.